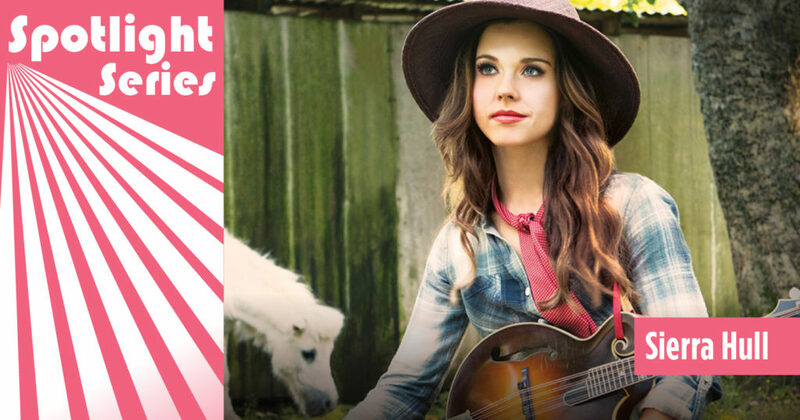 Tonight, GRAMMY-nominated singer-songwriter Sierra Hull will enchant Levitt AMP Middlesboro concertgoers with her honey-crisp vocals and elegant command of intricate, bluegrass-inspired mandolin melodies. Once a teen prodigy from Tennessee, Hull is now a rising star in her mid-twenties who found her own unique voice and is using it to wow audiences, critics and living legends like Béla Fleck and Alison Krauss. Tonight’s performance will be Hull’s second Levitt AMP Music Series appearance, after delighting Levitt AMP Sheboygan audiences last year. In anticipation of tonight’s show, we’re bringing you 10 fun facts about this incredible talent! 1) Hull grew up surrounded by gospel and bluegrass in Byrdstown, Tenn.—a rural 815-person town in eastern Tennessee near the Kentucky border—often making music with her family in their local church. 2) As a young child, Hull dreamed of playing her very own fiddle. When she was seven, a generous Christmas gift from her grandmother, great aunt and great uncle brought that dream to life only to reveal that her hands were too small to play a full-sized fiddle. While waiting for a smaller fiddle, her father taught her a couple songs on his mandolin and she was immediately hooked. 3) Showing extraordinary talent at such a young age, Hull was regularly invited to jam sessions with local and regional acts—including a jam session with bluegrass mandolinist Sam Bush at the International Bluegrass Music Association Awards at the age of nine. 4) Hull released her debut instrumental album Angel Mountain (2002) when she was only 10 years old. 6) Krauss invited Hull to perform alongside her on the iconic Grand Ole Opry stage in Nashville, Tenn., when Hull was only 11 years old, two years before Hull was invited to sign to Krauss’ label, Rounder Records. 7) In 2005, Hull toured with her multi-instrumentalist brother and bass-playing father. Hull recalled her father saying, “I’m learning to play bass because you can’t afford a bass player and you have to have somebody in your family with you.” Hull credits both her parents for being so supportive of her musical pursuits. 8) Hull was the first bluegrass musician to receive a Presidential Scholarship to study at the Berklee College of Music in Boston, where she graduated with a degree in strings in 2011. 9) That same year, Hull had the opportunity to perform alongside label mates Alison Krauss and Dan Tyminski as part of Country Music: In Performance at the White House–a PBS music special in the East Room of the White House, hosted by former President Obama and Mrs. Obama. 10) In 2016, Hull’s Béla Fleck-produced album, Weighted Mind, received a GRAMMY Award nomination for “Best Folk Album.” A true passion project, Hull wrote 11 of Weighted Mind’s 12 songs (also arranging the 12th tune). Rooted in Hull’s vocals and mandolin-playing, the album also features bassist Ethan Jodziewicz, Béla Fleck’s banjo-picking, and entrancing harmonies by Krauss, Abigail Washburn and Rhiannon Giddens. Tonight, if you happen to be in Middlesboro, Ky., be sure to swing by and experience the grace, charisma and impeccable skill of this star on the rise! She was absolutely incredible this evening in Middlesboro! That’s wonderful! So glad to hear you enjoyed the show.